Hello fellow momma!! How are you all doing today? I’m excited again to be with all of you here again today. My husband took the kids out for the evening. It’s my Monday night to work and so it’s so nice and quiet in my house. I figured it would be a perfect time to record this podcast in between coaching calls so if you are loving this podcast please please please leave me a review on iTunes. It helps other moms like you who are struggling to lose weight find this life-changing information. If you are unsure how to leave a review, I’ve written out the entire process in the show notes which I will add. So hello again to all of you! How are you all doing today? What I’m going to talk about today is there’s no such thing as a perfect mom. 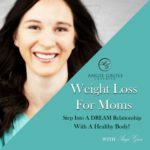 I just had a client reach out to me wondering if I’ve ever coached moms on getting through the expectations that we have for our kids and when they don’t meet those expectations then we feel guilty because we lash out at them or yell at them or we just treat them in a way that after the fact we weren’t completely happy with ourselves. This is something that all of us moms go through right? We all have this definition of what the perfect mom should be like. I remember before having kids and my coworkers would talk about certain ways that they were parenting. I remember saying to myself oh I would never ever ever do that. When I have kids, co sleeping was one of them, and after I had Sebastian. He is a horrible sleeper. Which till this day he is a terrible sleeper. I remember around three to six weeks somewhere in there. I was so exhausted. I was waking up every couple of hours to feed him. That I decided to start co sleeping. Guess what we started to get some sleep. He started to get filled and he was a full baby happy baby. Mama was getting some sleep and life was great. I remember co sleeping was one of the things I would never ever do. Still do to this day actually last night. I was up almost every hour with Paige. She’s either teething or just got a really bad cold. It’s always hard to tell with those little little ones what exactly is going on so still to this day we co sleep. I am 100% comfortable and happy with that decision. We all have these expectations on what a perfect parent is. When we have those expectations of ourselves that is when guilt can set in when we ourselves don’t meet those expectations. Whatever we think of something else is always a reflection of ourselves right? So if we were looking at our kids and we are expecting something of them and they don’t meet that. That reflects back to us right were making it mean I’m doing something wrong. Maybe we make it mean I’m not being a good parent because they’re not listening to me. Whatever the case is it is always a reflection of ourselves. Here we have this expectation of them. They don’t meet it. We get upset because we are making it mean that we are a terrible mom right? As we lash out at them, which then returns back to us making us think that we’ve done something wrong. At that point it is apparent that were not being a good enough parent. All of us struggle with this at one point or another. Here is how you get through it. First of all the biggest lesson in this podcast is let go of your expectations and you will never be disappointed. Now, this is something that is very useful in every single relationship. Relationships with your spouse. Relationships with your kids. Relationships with your coworkers. Whatever the case may be if you let go of those expectations you will never be disappointed. The second thing is you cannot control other people no matter how hard you try. Including our children. You can guide your children to a certain way of living and being. You can teach them as much as you possibly can. They will still grow up and ultimately do what they want to do no matter how hard we try you cannot control other people. It’s when they don’t meet those expectations and they don’t listen to us and that is when we make it mean something about ourselves. It starts to create a feeling within us. I would say 9 times out of 10 when I’ve coached myself through a scenario, it’s always come back to I’m not being a good enough mom. When you look at that and you can clearly analyze okay am I really not being a good mom in this situation. Most of the time you can say no, I am being the best mom that I possibly can be right now with what I have. I think us moms put so much pressure on ourselves to be this perfect mom that looks so good for society. But ask yourself, are you legitimately not being a good mom right now. I bet 9 times out of 10 you will disagree with that statement. Remembering when you have expectations for other people expecting them to live up to those expectations and when they don’t you’re going to be disappointed. It’s because of something you have set for yourself. It has nothing to do with them. Same with not being able to control other people. If you remember those three things. Coach yourself in the moment and say “What am I making this mean? Why am I upset right now?” and 9 times out of 10 it’s going to be I am a terrible mother. I’m not doing a good job. Something’s gone wrong. Ask yourself is it true. Secondly let go of expectations. Once you do that you will never be disappointed. You cannot control other people no matter how hard you try. With those three things right there, you can step back and look at your situation a little bit clearer, more aware, and make more logical decisions with your prefrontal cortex instead of letting your subconscious mind take over in the moment. Your subconscious mind is almost always telling you that you’re doing a terrible job. You’re not doing it right. You’re not good enough. You’re not being a good enough mom. We all need to let go of what that perfect parent is and really look at the facts of the situation and make a decision from what we have with what we got. I hope you guys all enjoyed this episode. I have another coaching call that I need to jump on but if you have any questions. For all my military mommas I have already created half of my six-month program. I’m down 19 pounds since I first started I was 147 after having my daughter and so in four months I’m down to 129 and already passing height weight and PT. I am so happy to report that I’m passing all my events within the time that I need to do it. My next goal is to actually do a PT test from start to finish in order to make sure that I have enough endurance to pass the PT test all at once. I’ve opened up a few more spots for one-on-one coaching if you are ready to lose the weight and stop struggling with your PT test once and for all. You can email me at Angie@Angiegross.com and sign up for a free mini session with me. I hope you guys all enjoyed this episode and I will talk to all soon.